That is SO good !! Certainly hides the pigs ear that you started with. It just shows, give a craftsman something "like"
and it will come out as a real jewel. Thank you Geoff - much appreciated. I won't post a blow-by-blow of the second build as the methods used and problems encountered will probably be pretty much the same as before. However, just to prove that there is a second build - and I'm not posting a coach that I finished ages ago! - here's a shot of one of the sides lined and lettered and now awaiting varnish before the underframe is painted matt black. It will not be quite as reflective once under a coat of Dullcote although a final thin brush-painted application of Klear will enhance the richness of the colour that tends to be muted through varnishing. Some progress with coach two: glazing will follow and the brass work picked out before the body is masked up for the under frame and chassis to be sprayed matt black. Once done, the unattached side will be held in place with rubber bands to test the wheel sets for squareness and smooth running.Some adjustment will be needed, it never really works first time. The roof has been primed and now awaits detailing. Interior partitions need cutting and painting also. The third coach has now been dismantled, stripped and primed. I'll need to buy some more paint to complete it however. Second and final coach completed: the Brake Third. There is one further coach to complete, the All-Third, but that will have to wait another day: I want something a little less trying next! The Brake Third was much more difficult than I had anticipated as the two sides were not wholly symmetrical. This created difficulties in fitting both the wheel-sets and the roof. Getting everything square and the wheels level took a long time. It also runs grumpily through slips and some pointwork but that, I think, is a back-to-back issue. 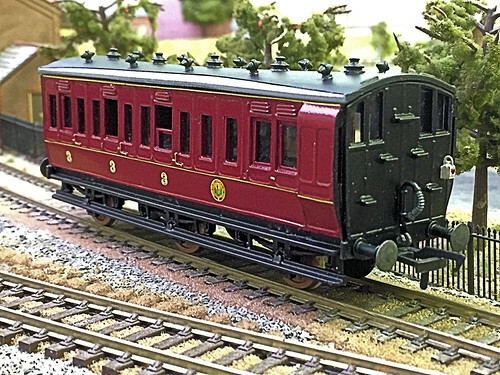 It's an attractive vehicle though and pairs well with the Passenger Brake Van. Last edited by Lysander on Fri Jun 22, 2018 1:51 pm, edited 1 time in total. Beautiful Job Lysander, really nice coaches! Remarkable transformation Tony. Regardless, the pleasure's in the doing I'd say. They look absolutely stunning, such depth to the colour. Would it be possible to see a bit more of the backdrop, it also looks really interesting, is it something you've painted yourself? I know those backscenes. They are Peco backscenes. I used Brian Sheriff for my last layout which is another commonly used back scene from the past. It's a mixture of backscenes Pete, put up quite a long time ago now. I will try to video the full length of it when I'm next at the club. Oh, and thanks for the comments. The richness of colour is a result of two light applications of 'Klear' over the semi-matt varnish sprayed on to protect the first paint coat and the lining and numbering. The varnish, although very thin, does tend to take some of the richness out of the colour: 'Klear' puts it all back in spades. How do they run? The PLV runs quite well and keeps to the track through points and slips as long as it is moving at a sensible speed. As an old coach, by the mid-40s, it would not have spent much time behind an express so branch/suburban speeds would be prototypical. The Brake Third is more of a problem. On level track, and with straight or reasonable curve running, she's fine. Some points she does not like though and slips are a definite no no. I'm pretty sure that it's just a back-to-back issue and, in due course, I'll attend to it. For the time being, I just like looking at them! But, it'll be fixed [in time for your 2019 show!!]. If it isn't, the wheels will be cut out and replaced with, probably, etched w-irons fitted inside the castings. 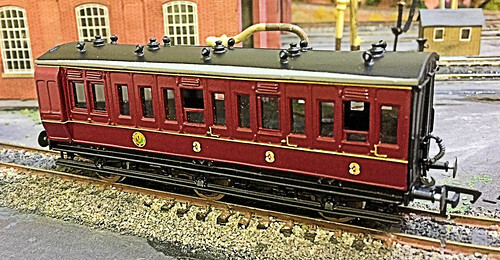 Using the original wheel sets and cast w-iron/axle box arrangements is always fraught with these old kits. I've never not had one run quite well eventually but, sooner-or-later, I'll run into the sand with one . In the meantime, remember this [not part of this competition]? It nearly flew through the window several times before it was finished. It was a GWR Tri-Compo and several ran on the Cambrian. They also featured as rather charming camping coaches. If you dont mind too much about the finer details, you could turn or grind the flanges off the centre wheels?